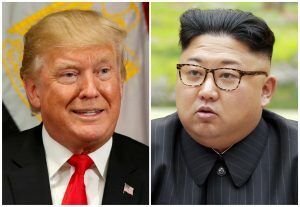 North Korea’s foreign minister told reporters Monday that President Donald Trump’s weekend tweet about leader Kim Jong Un was a “declaration of war” that gives his country the right to take “countermeasures,” including the right to shoot down U.S. bombers outside of its airspace. “Since the United States declared war on our country, we will have every right to make countermeasures, including the right to shoot down United States strategic bombers even when they are not inside the airspace border of our country,” Foreign Minister Ri Yong Ho said to reporters in New York. On Monday, White House Press Secretary Sarah Huckabee Sanders said the U.S. has not declared war on the country. Mr. Ho’s statement came as he was leaving the UN General Assembly’s annual weeklong summit, during which Mr. Trump escalated rhetoric against Pyongyang, threatening “total destruction” of Kim Jong Un and his regime. “Rocket man is on a suicide mission for himself and his regime,” he said during his first speech before the UN on Tuesday, using a nickname for the North Korean leader that he repeated over the weekend. “Just heard Foreign Minister of North Korea speak at U.N. If he echoes thoughts of Little Rocket Man, they won’t be around much longer!” Trump tweeted Saturday. “His remarks which described the U.S. option through straightforward expression of his will have convinced me, rather than frightening or stopping me, that the path I chose is correct and that it is the one I have to follow to the last,” Kim Jong Un wrote, referring to Trump. North Korea had already threatened to test a hydrogen bomb over the Pacific Ocean on Friday, the day after Trump signed the strictest sanctions yet against Kim Jong Un and his regime. (It has twice in recent weeks flown missiles over Japan).